Overall, this is a journey, both real and figurative, about unconditional love and acceptance, both of ourselves and others. Abuela shows Julián that she will not only care for him, but will help him find his way no matter where it leads him. When I first saw Julián, what kept me coming back over and over was Love’s fantastic and rich color palette. The almost craft paper that she has used for her pages really makes the colors and the details in every character pop. For more information about this particular artistic choice check out this interview. Many of the spreads involving Julián’s imagination have a watery feel, where Love has used teal gouache as an almost wash, contributing to the dreamy softness of the narrative. This whimsical softness carries over as Julián’s imaginary play meets reality when he and Abuela venture to what looks like Coney Island’s Mermaid Parade. The visual connections that Love weaves between Julián’s imagination and reality are numerous, so I will give you a few of my favorites. We see the swirling fish on the wall of the rec center, then repeated in Julian’s subway day dream. In that same subway daydream we see a large fish with a wonderful pattern who gifts Julián with a necklace, the same pattern is repeated on Abuela’s dress later. Love, in using so little text and heavily relying on her visual storytelling has left space for readers to play, imagine and feel along with Julián. The moment after Abuela discovers Julián playing as a mermaid is particularly emotionally powerful. You see him thinking about why she would be upset, even touching and looking at possible reasons including himself. The universal nature of the emotions Love draws on throughout her narrative only serve to make the message more personal. In this way Love has made a powerful moral statement without preaching, because the statement comes from an understanding within the reader rather than the text. What do you think? 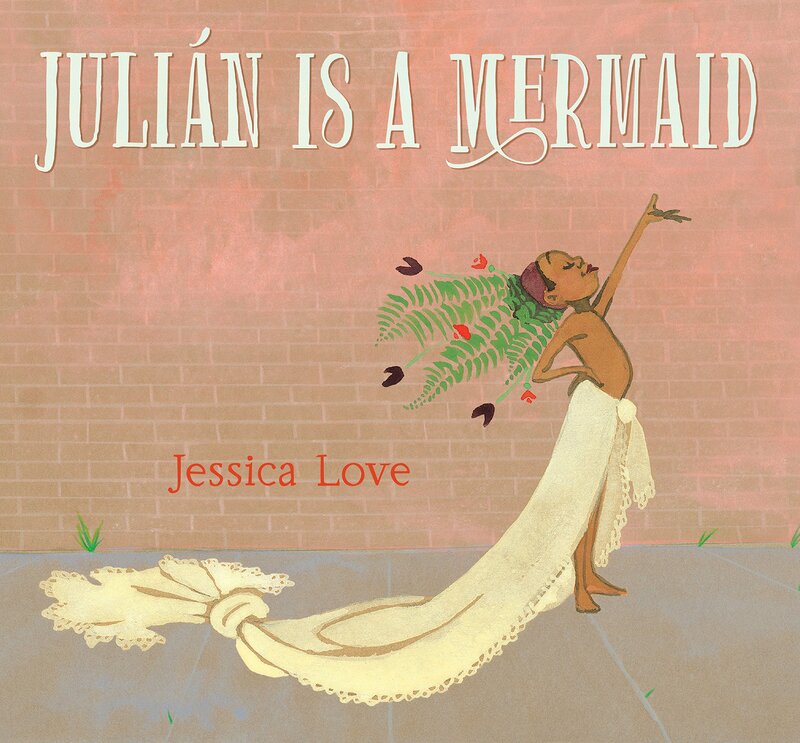 Is “Julián is a Mermaid” the most distinguished picture book of 2019? Be sure to cast your vote for ICPL’s 2019 Mock Caldecott between December 1st and January 21st.